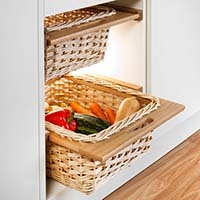 Our range of pull out vegetable baskets offer an attractive way to increase kitchen storage for not only vegetables, but other items too (we store our tea and coffee in ours) All of our pull out vegetable baskets are sold in sets of two and are held on runners to maximise safety and security. They are also available in either Beech or oak baskets. If you have any questions about the range, or how they can fit into your kitchen space – just get in touch and we will be happy to help.